The record is made up of 1 volume (25 folios). It was created in 29 Oct 1869. It was written in English and French. The original is part of the British Library: India Office The department of the British Government to which the Government of India reported between 1858 and 1947. The successor to the Court of Directors. Records and Private Papers. Mr. Otway to the Secretary to the Admiralty. Sir, Foreign Office, October 25, 1869.
certain months of the year. * Nos. 25 and 26. This file contains correspondence between British officials regarding their attempts to monitor and prohibit slave traffic on the East Coast of Africa. The correspondence dates from March 1869 to October 1869. Folio 71 - French Government boat registration papers that had been given to 'Arab Dhows' allowing them to travel under the French flag. Folio 73 - A chart entitled 'Memorandum of Number of Slaves landed and liberated at Aden, and how disposed of'. Folio 74 - A copy of the Slave Trade Jurisdiction (Zanzibar) Bill, May 1869. 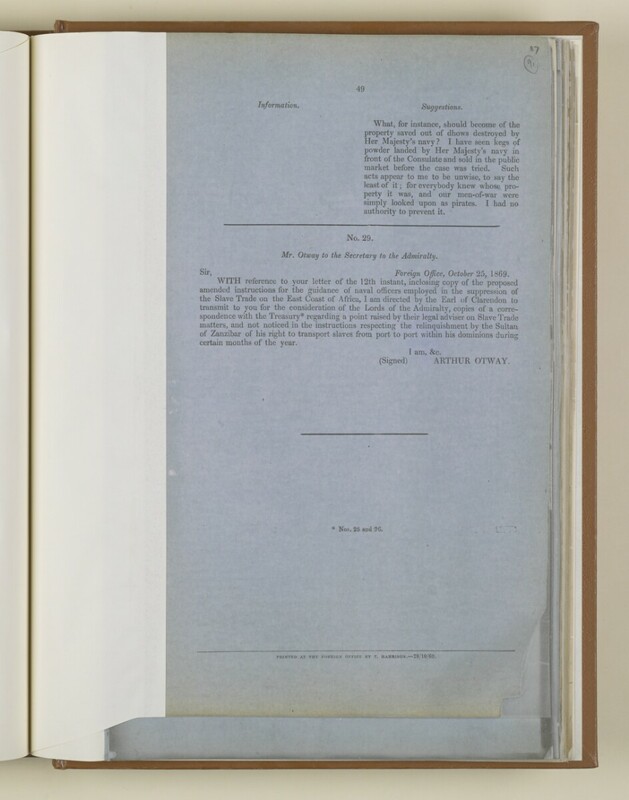 Folios 89-91 - 'A Memorandum by Mr. Churchill [Henry Adrian Churchill, Britain's Agent in Zanzibar] respecting Slave Trade on the East Coast of Africa'. The file is arranged in rough chronological order, with the earliest correspondence at the beginning of the file and the latest at the end of the file. Condition: contained within a bound volume that contains a number of other files. Foliation: The foliation for this description commences at f 67, and terminates at f 91, as it is part of a larger physical volume; these numbers are written in pencil, are circled, and are located in the top right corner of the recto The front of a sheet of paper or leaf, often abbreviated to 'r'. side of each folio. An additional foliation sequence is also present in parallel between ff 5-134; these numbers are written in pencil, but are not circled, and can be found in the same position as the main sequence.